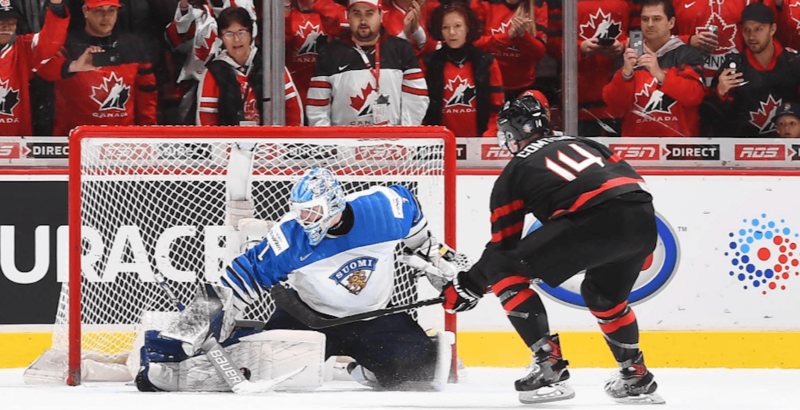 The agency that represents Maxime Comtois has responded to the barrage of hate comments he received following Team Canada’s 2-1 overtime loss to Finland on Wednesday. Comtois, who wore the C as Canada’s captain, was unable to score on an overtime penalty shot during the quarter-final loss. It was a shocking exit to the tournament for Canada, who failed to win a medal when hosting the World Juniors for the first time ever. The only returning player from last year’s gold medal winning team, Comtois has certainly seen the highs and lows that come with the spotlight that shines on Canada’s World Junior team. In the hours following the loss, the 19-year-old reportedly received a number of angry comments on his personal Instagram page. The ability to comment on his page has since been disabled. Maxime Comtois is the ultimate example of a Hockey Canada athlete who has grown through the ranks to become a selfless leader. No one is prouder to wear the maple leaf on his chest and C on his jersey. These young men understand and accept the pressure that comes with their roles in the hockey world. It is shameful and incomprehensible that a few cowards who can hide behind social media could make such vicious attacks on these young men’s character after they have battled their hearts out for their country. We will make this one and only statement on this subject, so not to validate anymore the cowardly comments made on social media. It was Maxime’s idea to use this as a learning moment for all the youth of Canada, that cyberbullying is a real problem, and like all bullies, we all need to stand up to them and call them out for what they are. Thank you for shedding a spotlight on a major problem in our society. Best of luck to all of the participants still battling in the [World Junior Championship], still the best tournament in the world. Though Comtois was Canada’s leading goal scorer in the tournament, scoring five goals in five games, he drew criticism for diving on more than one occasion in an effort to draw penalties. While Comtois was cyberbullied by some people online, the response from fans inside the arena was much different. Most of the fans in Vancouver stayed to salute Team Canada, despite the loss. While some idiots online will draw the most attention, they were certainly in the minority as most fans understand that the team is filled with teenagers giving their all for Team Canada.